Hundreds of schools are again closed in Northern Ireland with more snow overnight. Belfast's two main airports are open but cancellations and delays are expected to continue. City of Derry Airport reopened at 1100 GMT. Temperatures in NI dipped to their lowest on record with -18C recorded at Castlederg, County Tyrone. There has been a further 10 to 15cms of snow in some places, with freezing conditions making roads hazardous. BBC weather presenter Angie Philips said temperatures would again remain low on Monday, with conditions on the roads "treacherous". "Temperatures will fall dramatically tonight, maybe getting down below minus 15 celsius in the Castlederg area again, but many rural parts of the west probably dipping below minus 10 celsius," she added. "A severe frost will develop, with very icy conditions persisting over frozen and compacted snow. "Some freezing fog is likely in places again too." More than 500 schools were recorded as having closed on Monday. A number of train services were disrupted in Northern Ireland on Monday morning. Ciaran Rogan of Translink said bus services were "sticking to main roads", and some delays were expected on the Goldline service. Ulsterbus services were suspended in a number of areas including Ballymena, Coleraine, Antrim and Downpatrick. The Roads Service warned that driving conditions were still hazardous with overnight snow leaving a risk of ice. 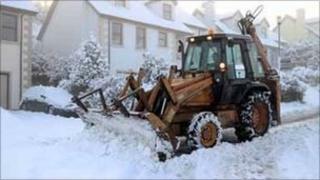 They had carried out salting and snow-ploughing operations throughout the weekend. Colin Brown of Roads Service said:"Even though roads have been heavily treated over the weekend, motorists in all parts of the network should be mindful that those surfaces have practically refrozen in some cases and care should be exercised at all times." Belfast International Airport spokesperson, Deborah Harris, said on Monday it had been a frustrating weekend for passengers. "Flights are taking off and landing this morning, albeit with delays," she added. "The Heathrow and London Stansted services this morning are cancelled because of issues in London. "It is the busiest time of the year with people trying to get home for Christmas and people getting off for Christmas." George Best Belfast City Airport said on Monday morning it was operating, but was experiencing some cancellations and delays "as a knock-on effect from other airports on the UK mainland". City of Derry Airport was closed until 1100 GMT, but is now operating, although it said flights were subject to delay. The three Northern Ireland airports have advised passengers to contact their airlines before travelling because of the impact of delays. EasyJet said the vast majority of its flights to and from Belfast are operating. "We have a small backlog of passengers returning to Northern Ireland, but are confident that these passengers will return home within the next day or two," the company said. SDLP leader Margaret Ritchie said the Northern Ireland Executive needed to set up an inter-departmental taskforce to review systems for dealing with extreme weather events. However, Regional Development minister, Conor Murphy, has said he believes this is unnecessary.